Garrett 1166020 CSI PRO-POINTER Pinpointing Metal Detector FREE SHIPPING! 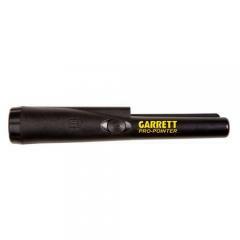 The Garrett CSI Pro-Pointer speeds up evidence search and recovery. The static detector sounds an audible and vibrating alarm that increases in intensity the closer it is to the target. It is very easy to use, too. The microprocessor circuitry delivers maximum sensitivity automatically, and will not interfere with your metal detector. It features a pinpointing tip and 360 degree side scanning capability, allowing you to find areas of interest and then hone in on the item. It comes with a woven belt holster for convenient portability, an LED flashlight for low-light recovery, and a scraping blade to remove soil from buried objects. The Pro-Pointer is tough and fully waterproof. It can be used in the rain, or even washed in running water. ©2002-2019 CopsPlus.com: Garrett 1166020 CSI PRO-POINTER Pinpointing Metal Detector FREE SHIPPING!